Welcome to author David Fraser who skidded in under the deadline to share the hobby he has loved since he was a boy, making model planes. Like most of us, life's priorities don't leave much time to spend with our pastimes, but David carved out some time and challenged his skills in order to complete a model plane just for this guest post. Hey, David, I am honored you made it for our readers. High fives all around! Readers, check out David's book, José Picada, P.I. : Deception al Dente, a paranormal mystery authored with his sister Heather Fraser Brainerd. The next book in the series is due to be released sometime this year. My wife can’t complain too much. Not about the money, the time, or even the occasional smell of paint and glue. It is, after all, her fault. I had long since outgrown my fascination with plastic models. It’s a typical story. As a boy, I made all sorts of models. Cars, space ships, tanks, planes, it didn’t matter. If it was plastic and could be painted, I’d build it. But then a strange thing happened: adulthood. Over the course of my teenage years, things like girls and baseball drew my attention away from that big cardboard box in my closet that held all those worthless lumps of plastic. David says, "At the current rate, it will take over sixty years to complete all these." Fast forward to Christmas of 1999. In desperation for last minute gifts and time running short, my wife (then fiancée) hit the local dollar store. Included in her purchase was a model airplane. She had no idea how much that $1 would end up costing. A few days later, she was at work and I was sitting around her apartment with nothing to do. Out came the model. After a quick trip to the toy store for glue and paint, I was in business. But it didn’t stop there. I was hooked, and it was worse because now I had my own income and I could decide how to spend it. Over the next few months, I amassed a decent stockpile of kits and supplies. My approach this time around was different. You see, this time around, I cared. As a kid, I’d stick everything together with great big globs of glue and haphazardly paint things whatever color was on hand at the moment. Now things had to be right. Seams where two plastic pieces met had to disappear. Paint (the correct color, not some random one) was applied with an airbrush. Even at the ripe old age of twenty-something, I was still learning patience. There was no rushing to get things done, as that was the easiest way to make dumb mistakes. Also, I constricted my subject matter. No longer did I build any model that came across my desk. The focus was almost exclusively on aircraft. Initially, I had seemingly unlimited time to work on my new hobby. Right after work, I would disappear to the workbench and spend most of the evening working on the multiple models I had in progress. My friends complained that they never saw me. I missed all my regular television shows. Okay, so maybe that last one isn’t so bad. The point is that when I first got back into modeling, I could crank a decent model out in about two weeks. Fast forward to May 2001. By this point, I was now married and back in college. And I was a father. Unlimited free time was now a thing of the past. I could now crank out a decent model in about two months. Fast forward to January 2005. I was married, a homeowner, in graduate school, and a father two times over. I could now crank out a decent model in about two years. Since then, I’ve always had at least one model in progress. By my count, I’ve only finished a grand total of four over the last eight years. The work sessions are far shorter and very infrequent. Occasionally, when the kids are busy with something else and I don’t have a long list of chores to do around the house and there isn’t some writing deadline hanging over my head, I can sit for an hour or two and work on one of my worthless lumps of plastic. There’s something relaxing about carefully sanding plastic until it is glassy smooth. When the subject of this blog first came up months ago, I spent a good deal of time thinking about my relationship with model airplanes and how it’s changed over the years. I didn’t realize how much I missed the days when I could lose myself in the hobby for prolonged periods of time. I gave myself a challenge: pick a relatively easy kit from the pile and build it in a month. It was an easy challenge. There was no way I could fail. Well, of course I failed. Here we are, two and a half months later, and it’s almost done. It was a little sad, knowing that even if I wanted to, I couldn’t recapture those early days. At least, not in quantity. Though much less, the time spent felt the same, locked away in my garage with the hum of the air compressor drowning out the any noise trying to intrude from the outside world. Nothing existed for these short stretches of time except me and a few ounces of plastic. Thirty-five hours later, a 1/48 scale P-40 emerges from its cocoon. EPILOGUE: I’ve been working on this blog entry bit by bit for the last month or so. It was scheduled to be posted on Thursday, August 15. My target date to submit it was August 8. I try to finish things well in advance if possible, but writing this dragged on longer than usual due to my delays in finishing the model. Well, here we are on August 11 and it’s finally done. I’d put its completion time at about thirty-five hours over the course of ten weeks. Not bad for a married guy with a house, a pool, two kids, two cars, and four pets to take care of, right? Not bad at all, David. That plane looks very sharp. Thanks for taking time out of your busy life to share this hobby with us. Having left the dull life of workers’ comp insurance behind to strike it out as a private detective, things aren’t going well for Josie P. Cates. Her new career isn't as exciting — or lucrative — as she thought it would be. As her bank account dwindles, her first major client finally walks in the door. Chef Marco, a successful local restaurateur, hires Josie to find out who's skimming money from his business. It doesn't take long for Josie to discover that things at Bistro Italiano aren’t what they seem. Secrets seem to cling to Chef Marco like splattered marinara sauce. With the help of friends both old and new, Josie unravels a case that takes her from the bistro to the world of deadly dark magic. At least it keeps things from being too boring. David Fraser, born in 1973 in Canandaigua, New York, stands six feet tall (1.83 meters for those of you who insist on using measurement systems that make sense) and has way too many college degrees. These include (in both chronological and alphabetical order): a Bachelor of Fine Arts from Syracuse University, a Bachelor of Science (Mathematics and Computer Science) from Emory & Henry College, and a Master of Science (Applied Mathematics) from Rochester Institute of Technology. More importantly, he is the father to two daughters who do their best to make sure he has little time to write (it usually involves My Little Pony) (I mean the daughters are doing something involving My Little Pony; David Fraser doesn’t write about My Little Pony). He enjoys using parentheses and writing about himself in the third person. His first book, José Picada, P.I. : Deception al Dente (co-written with his big sister Heather Fraser Brainerd) is available from MuseItUp Publishing. 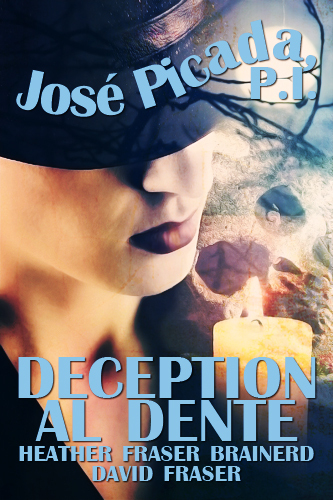 The second book in the series, José Picada, P.I. : The Sound of Sirens, is available nowhere. Yet. It’s due out later this year, so just be patient. He can be stalked on Facebook (Brainerd & Fraser) or WordPress (Driving Blind Productions). The kids will be back in school in less than a month, so those sites will be updated more frequently. Enjoyed your post, David. I think it would be hard to partner on a book. I'm sure you each have the characters taking you in different directions. I enjoyed your post, David, and your model looks superb. My oldest brother loved model-building, too, as a teenager, but like you his hobby petered out once he had a family and responsibilities. I have an idea for a Christmas present now, though! 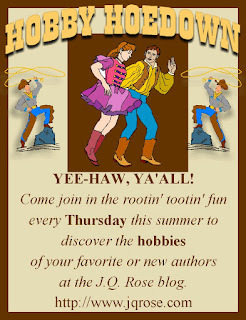 And JQ, I'm looking forward to my visit during hobby hoedown's extended run! I think it's great you do model planes. I went through a thing like that with knitting many years ago. I made everyone imaginable slippers. And they were nice slippers too. Victoria, I too cannot imagine having a writing partner on a book. That means I'd have to be responsible about writing time and effort, but it could mean I would have more chocolate to keep me going!! Helena, my brothers were plane builders too. I remember the model planes hanging from the ceiling of their bedrooms. BTW, they both got their pilot licenses for small planes. Those childhood passions really do affect our adult accomplishments. Looking forward to your post too, Heather! Suzanne, I know what you mean. People who make ceramics give them away to everyone. Hey, I think baking is a good hobby...always ready to try their latest recipe for them! Thanks for stopping by. Hey, J.Q., these posts have been fun to follow. Hey, David. Before my husband and I were married, he had a roommate into model airplanes. His room overflowed with them and they spilled into their small apartment. :) I think it was neat you were able to reconnect to your hobby. How cool to work with your sister! Good luck with sales. I'll be checking out your book. Thanks, Marsha, Fun to host these creative authors too! I enjoyed your post, David. It brought back memories of my late brother (David) who used to build model cars. He had shelves full of them. It's good to have a hobby for relaxation. I just gave my granddaughter a collection of glassware including some carnival glass passed down from my mother.